Does anybody else suddenly have a craving for potato chips? Obi-Wan, in the original trilogy, didn't have much going on: he was of the previous generation of heroes, so he was just the stock Old Mentor character; the prequels, though (live-action and animation alike), truly make him something special. Like the Revenge of the Sith novelization says, he was viewed as the ultimate Jedi - "modest, centered, and always kind," but there's more depth to him than that. Push him far enough, and he becomes the most dangerous man in the galaxy, willing to mutilate and burn the boy he loved like a brother. He regularly defies the Council, but they still have faith in him and consider him their best Master. He's one of the best pilots alive, is an amazing marksman despite his distaste for blasters, and once loved a woman so hard that he would have willingly left the Jedi Order if she had asked him. There was a plain Obi-Wan figure in the normal lineup, but like so many Black Series figures, your odds of ever seeing it in a store were so low that Han Solo would get pissed at C-3PO for telling him about them. It was almost easier to get the SDCC exclusive version than the standard, even when it got one of those 40th Anniversary carded editions! 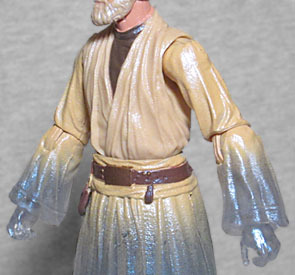 But this, though, is a Walgreens exclusive, depicting Obi-Wan in his Force Ghost form. Even the packaging gets in on the fun - it's the same style of box seen on all the other Black Series releases, though it trades the red side panel for a strong teal, as have the renderings of the character on the front and back, and even the tray behind the figure. It fits with the other releases, but is still clearly its own thing, for its own reason. The sculpt on this figure is unchanged from the three previous releases - so we've got Ben in his "I must remain anonymous, yet I wear my recognizable Jedi uniform every day" robes, with a decent Alec Guinness likeness. Actually, a quite good Alec Guinness likeness, considering this was done without the benefit of laser-scanning or paint-printing technologies. He looks tired and annoyed, which is befitting both the character and the actor. 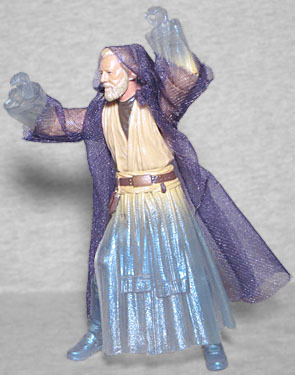 The toy is cast from translucent blue plastic, just like the original Ben "Oh-Blueberry-Wan" Kenobi was, but this one goes a step further by not only being trans blue - rather, like Vanishing Cream Beaker, he's given paint apps that fade in as you move closer to his center of mass. Below the elbows and waist, he's totally ghostal, while the chest appears solid. The paint has a faint blue tint and is sparkly, so it's clear that he's a ghost and not, like, teleporting away or whatever. The paint on the face is practically pearlescent! Short of finding a way to give the toy a transparent aura, or making it glow-in-the-dark, this is really the best possible way of making it clear that Obi's feeling super spiritual today. The previous Obi-Wans all came with his lightsaber, but this one doesn't - like they say, you can't take it with you! So his only accessory (if you want to call it that) is his outer robe. Don't think you'll be able to give it to your Qui-Gon, though, because this is just as translucent and blue as the rest of him. Well, purple, but what's the difference? ["red" --ed.] Yes, rather than being a dark brown robe made from solid material, this is more of a diaphanous mesh. It looks perfect on the toy, though, and that's what counts. 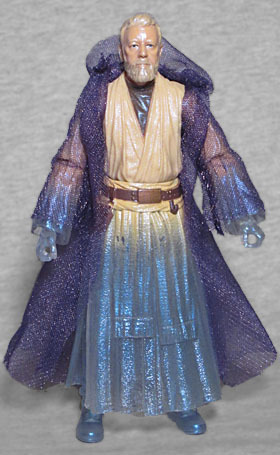 Ghost Obi-Wan didn't do much more than sit on logs and talk to Luke, but the toy retains all the articulation from before. The robes below his waist are PVC, so they'll flex out of the way of the legs joints a little bit, but don't plan on having him do any high kicks. The fact that the outer robe is softgoods means you can wave his arms around all crazy-like, like he's haunting Scooby-Doo and those dang meddling kids. Too bad he couldn't come with a log accessory, or a-- wait a minute, this should have been a Ben/Yoda two-pack! Both the molds exist, and both of them are ghosts! Then later, give us a ghostly Anakin head on this same body so we can have all three of the boys. 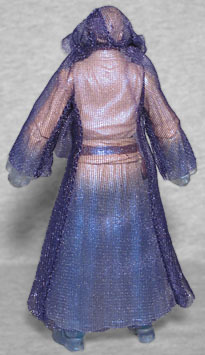 To get Kenner's Spirit of Obi-Wan figure, you had to mail away the UPCs from two bags of Lay's® brand Pizza Flavored Potato Chips and a check or money order for $1.99, then wait for the unarticulated figure to arrive in the mail, polybagged inside its plain white mailer box; as long as there's a Walgreens near you, this one is quicker and easier to get, looks and moves better, and has much cooler packaging. What a difference 20 years can make!